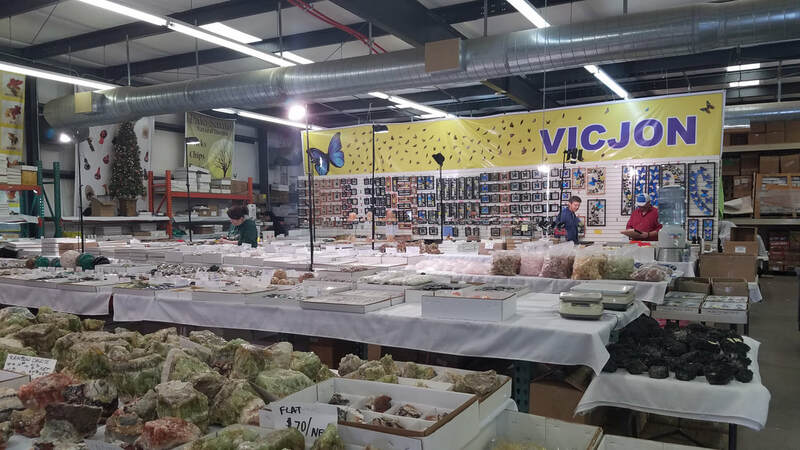 ​ The Oracle Wholesale Show ... about 15 dealers in a "light industrial" complex. 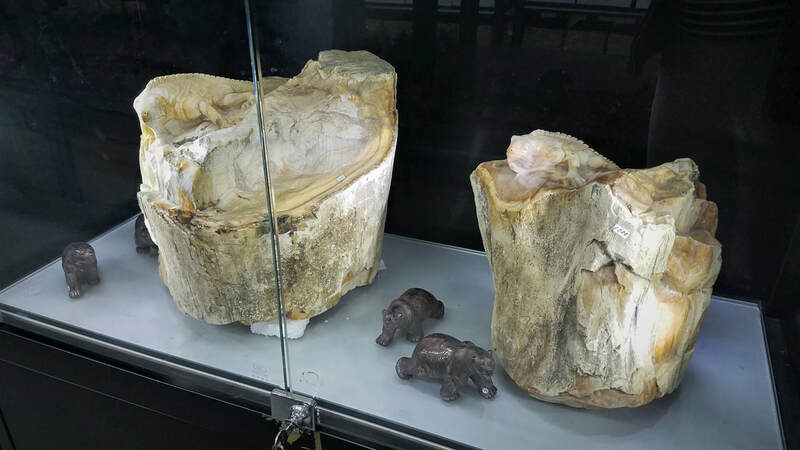 We had never seen these curious creatures carved from Burmese petrified wood. 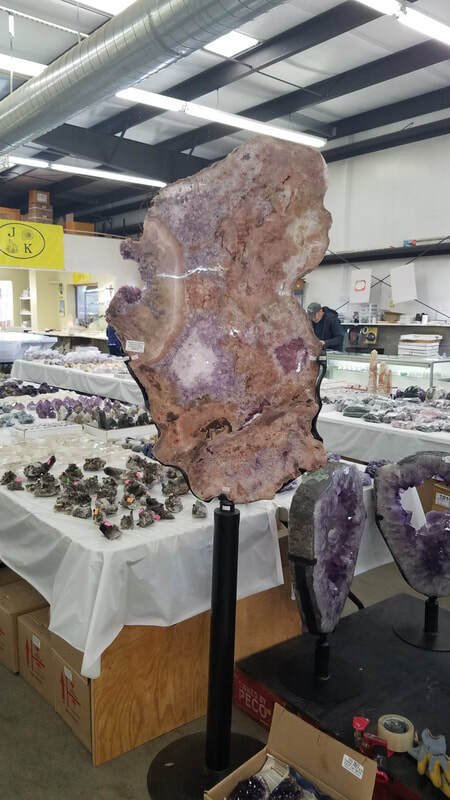 The nearby Top Gem Wholesale on Oracle draws a huge crowd, many of whom are dealers and shop owners purchasing flats of minerals for resale. 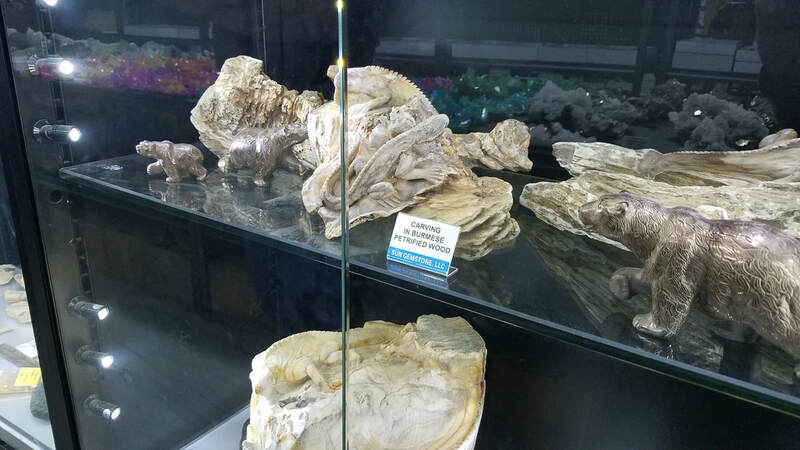 They are wholesale only and sell only natural minerals and fossils. 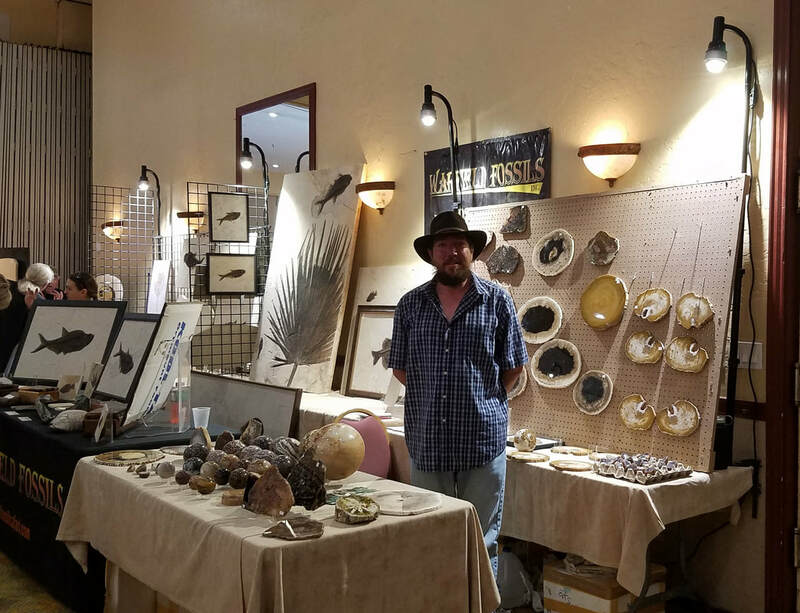 One of the vanguard shows at Tucson for many, many years is the Arizona Mineral & Fossil Show at the Hotel Tucson City Center. 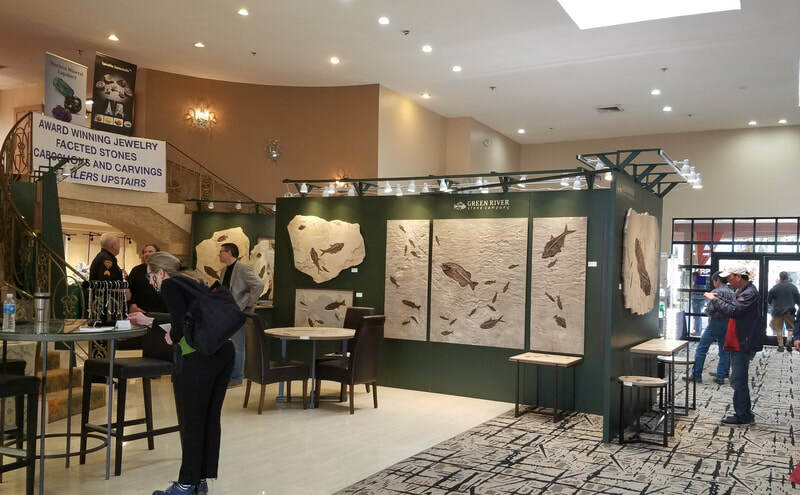 Known to us all for many years as The Inn Suites show, formerly promoted by Marty Zinn, this hotel-room and ballroom-based show is home to 249 dealers and (we find) is impossible to cover with just one visit. 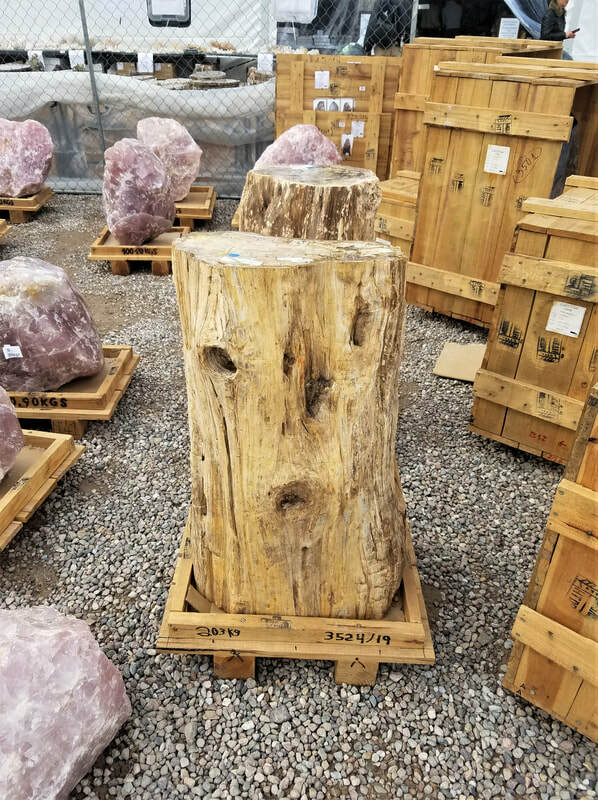 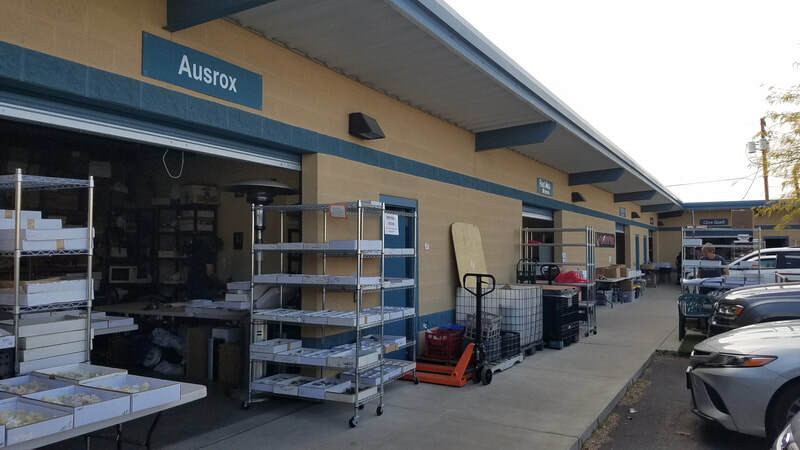 ​ The Arizona Independent Warehouse Show is what we would call a "pocket show" because it is out of the main traffic loop for the central shows, but one of our dealer/lapidary friends, Joe Cota, displays some wood here. 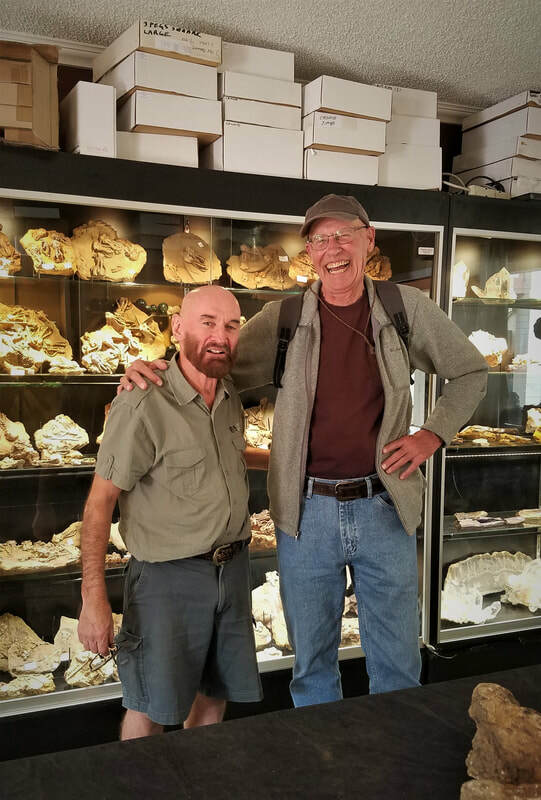 Jim sees Joe and Lucy at Quartzsite when he visits there in early January, so we usually can't add any new specimens from Tucson, but that does not keep us from checking it out! 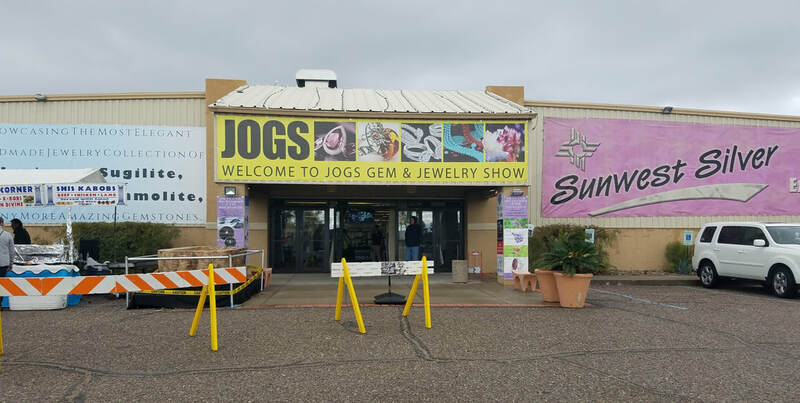 JOGS Tucson Gem and Jewelry Show is mainly that ... gems and jewelry. 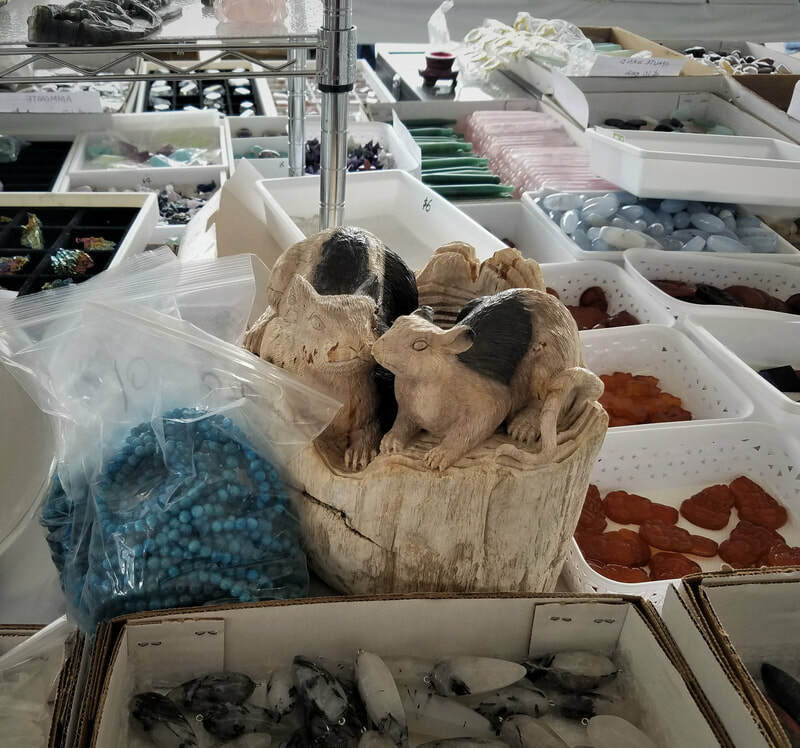 But in years past, we have found some fascinating art here, even occasional wood and agates. 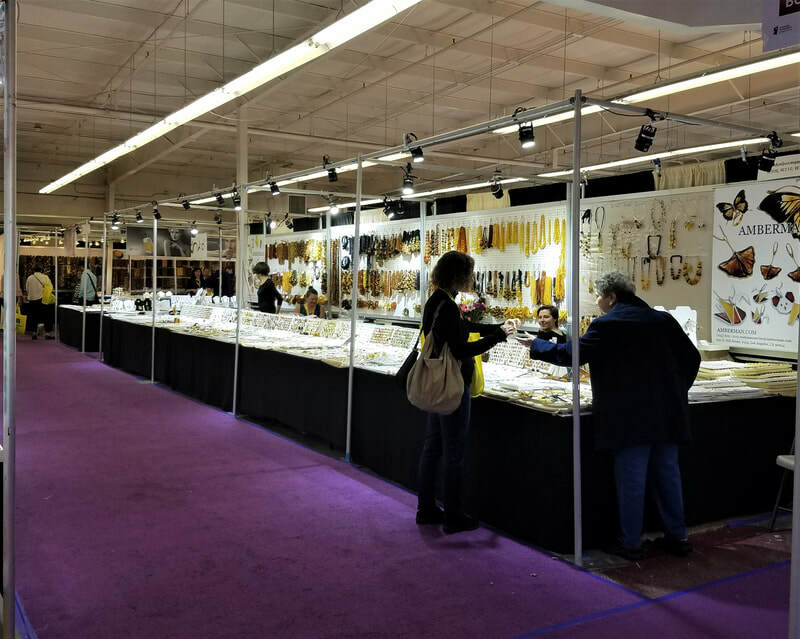 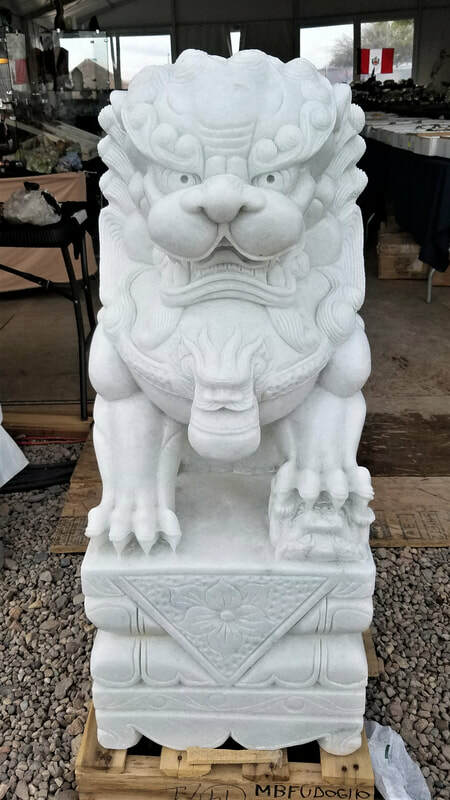 Whether we find anything or not (which we did not this year), it is an enriching experience to view the hundreds of dealers while exploring the trends in the lapidary arts. 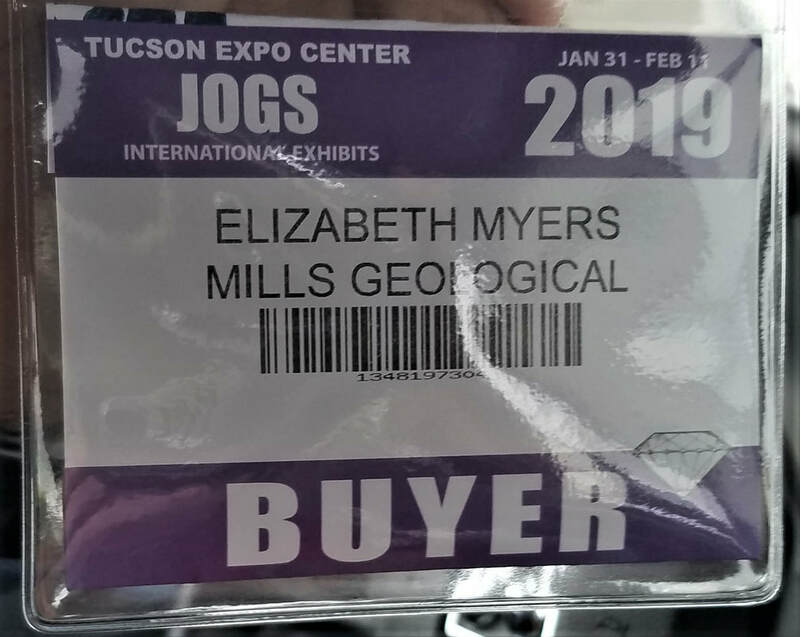 So, while Beth's credentials indicated that she is a "buyer," she was in fact just a "viewer"! 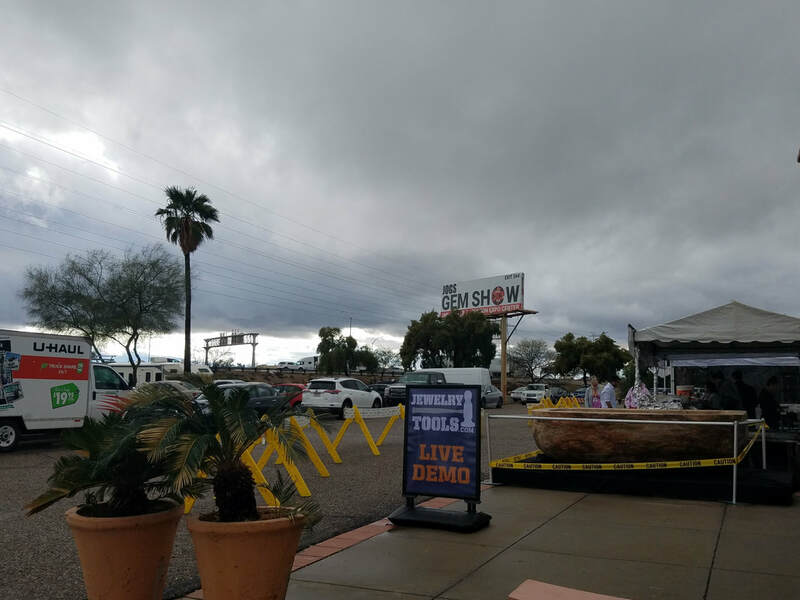 ​This city in the Sonoran Desert does receive rain year-round, but the largest accumulations are generally in the summer monsoons. 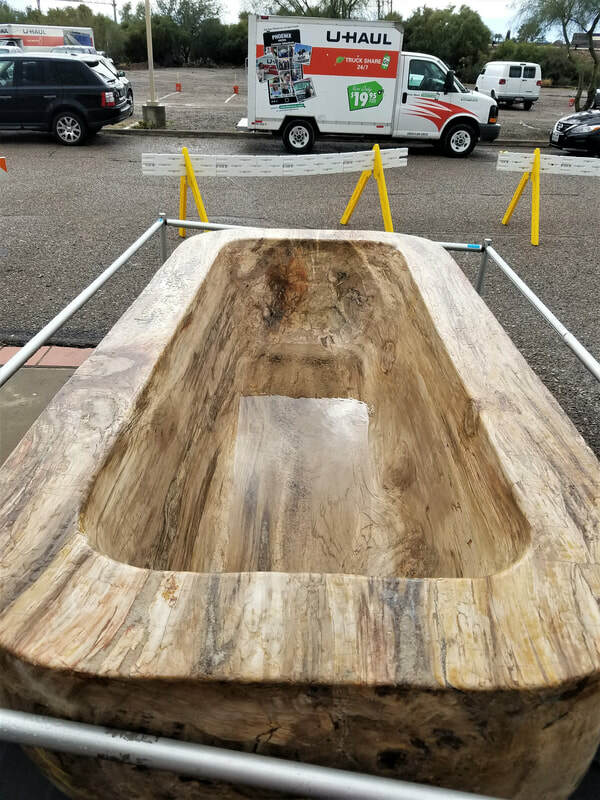 Even the bathtub cut from Madagascar wood (seen in the photo right) -- a different smaller version than years past -- began to fill with water! 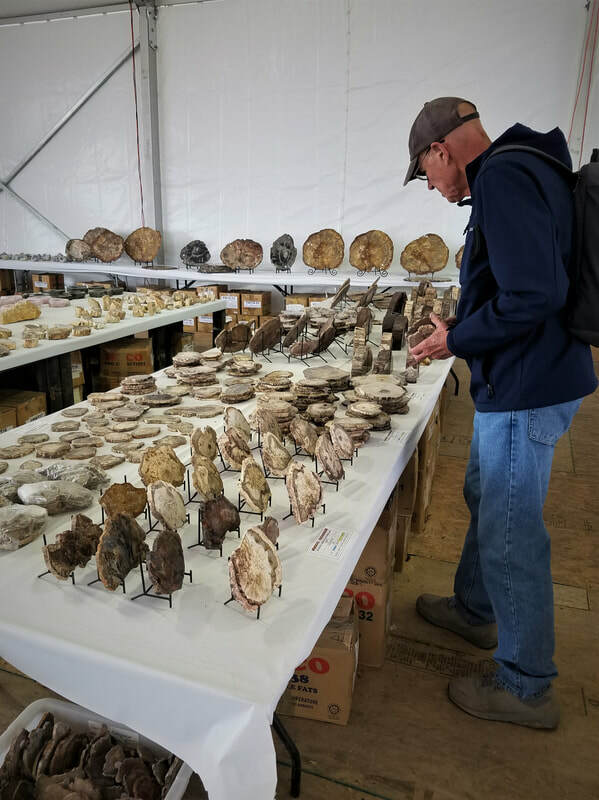 ​Amber dealers (from Poland, Lithuania, Russia, Columbia, Mexico and the US and Canada) numbered 32 at JOGS, clustered into one pavilion area of the massive indoor facility. 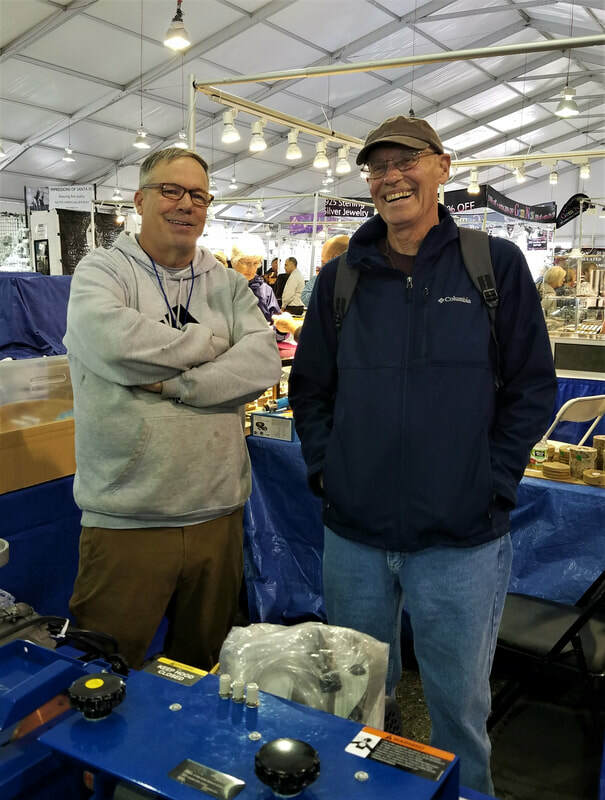 We always learn something new. 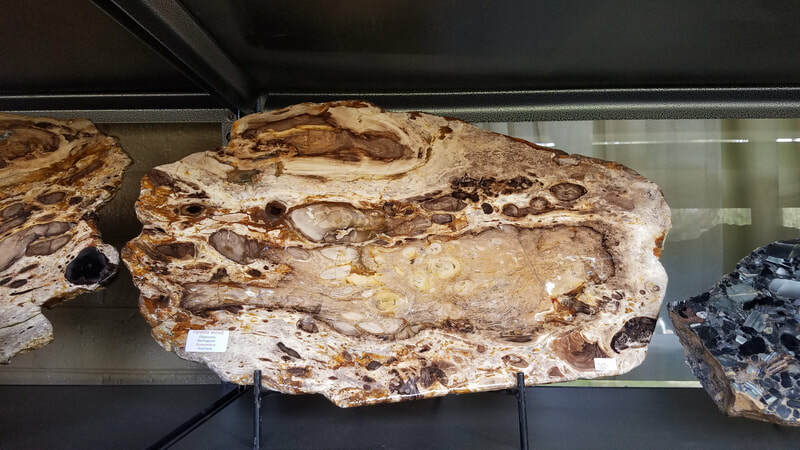 For instance, we did not know that the the oldest amber dates back to 320 million years ago. 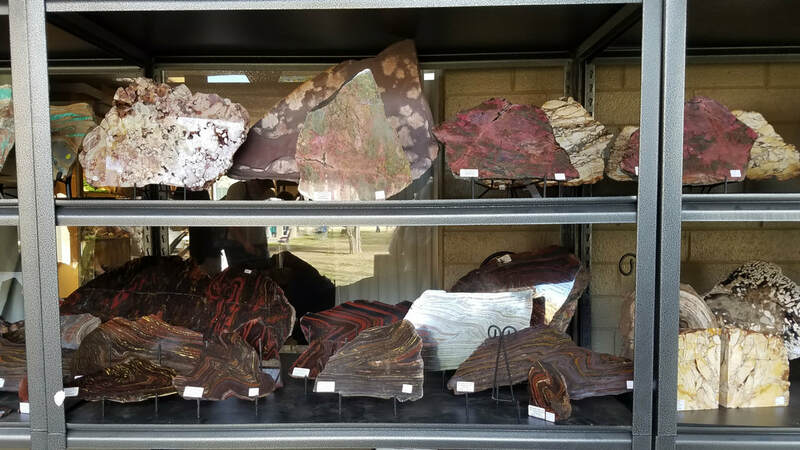 Kino Gem and Mineral Show at the Kino Sports Complex might be a bit misnamed because this show has more rough rock than many others. 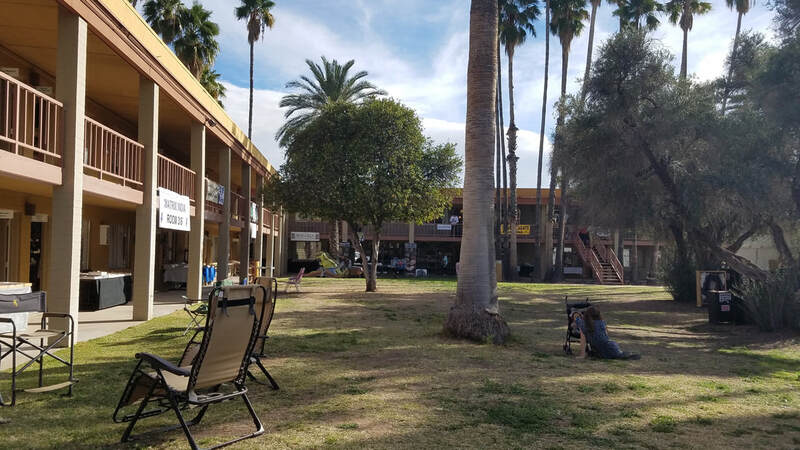 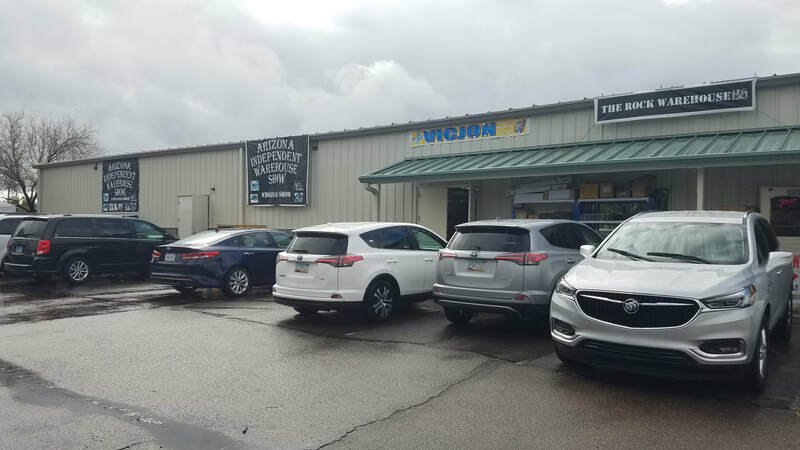 Most of the 200 dealers are located outside in tents, so when the Tucson wind and rain kicked in, they were forced to cover with tarps and close! 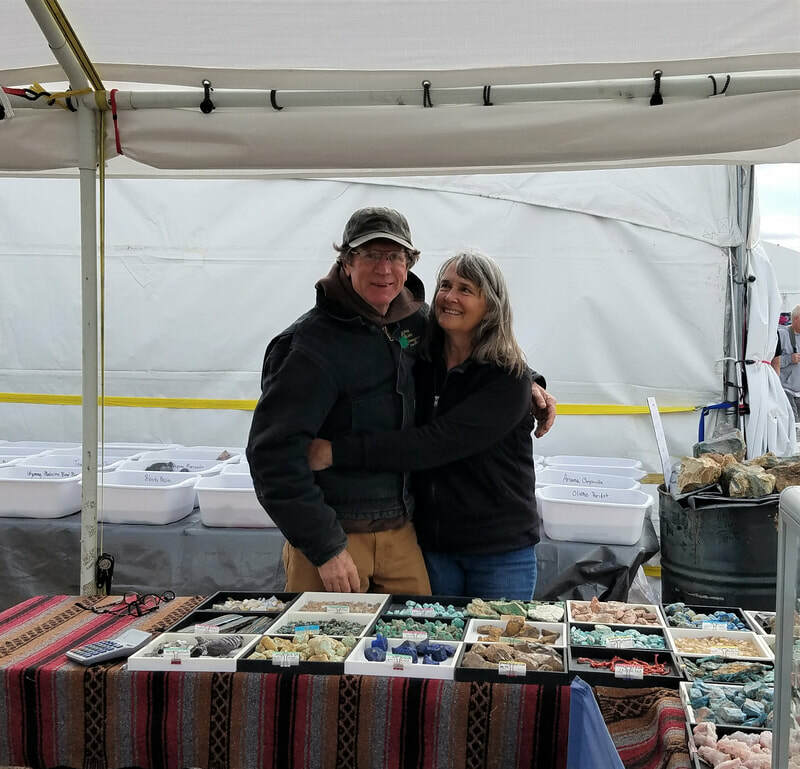 But when the sun returned, people were back to selling and shopping. 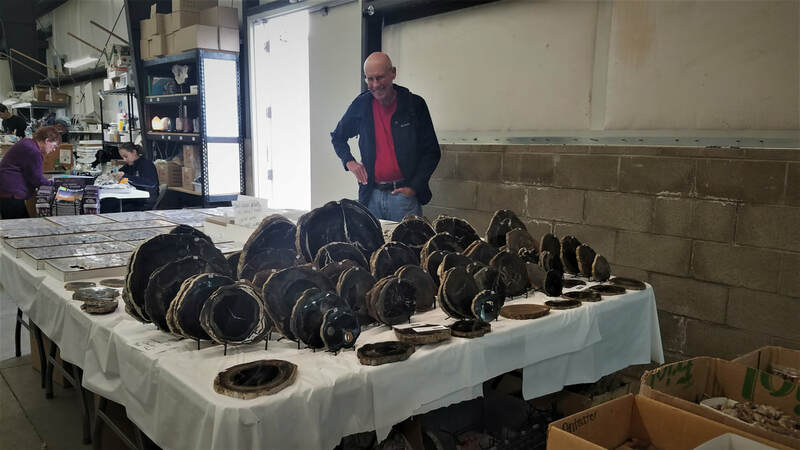 Items of all ilk are found here from Bison skulls to handmade inlaid tables and lampshades to lapidary slabs to finished jewelry, and some unusual carvings (a couple of which are shown right).